Chatsworth (population 1,225) is located in eastern Illinois about 35 miles north of Champaign. This places Chatsworth in southeastern Livingston County. U.S. Route 24 is the main highway to and from Chatsworth and is intersected by County Highway 3 in town. The Bloomer Line Railroad runs north and south through town and intersects with the Toledo, Peoria, & Western Railroad which runs east and west through Chatsworth. The railroad had a hand in naming the town, which was for the country home of the Duke of Devonshire. A branch of the Vermillion River flows on the east side of town as well. Chatsworth has a very long history of education. 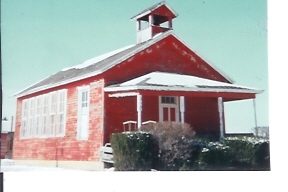 The first school in the village was opened in 1838, but replaced in 1870. 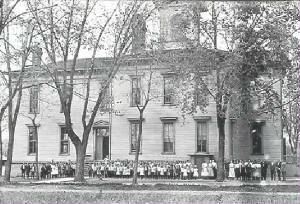 High school education dates back to 1876. The first graduating class for Chatsworth High School, which consisted of Mary Fosdick, Louisa Stevens, Emma Turnbull, and Eliza Dorsey, earned their diplomas in June 1881. 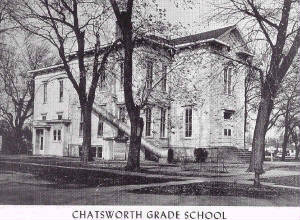 The original Chatsworth School (pictured below) housed both grade and high school students, and was known for its steep curving stairs. 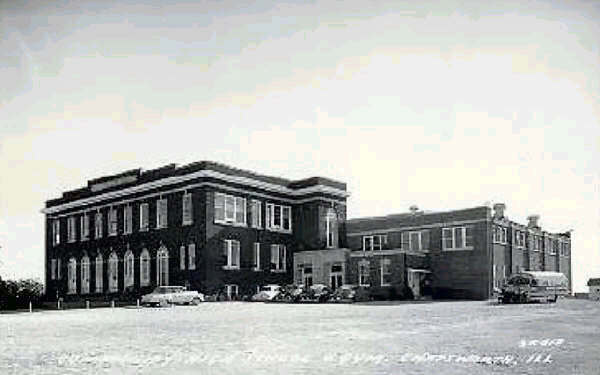 In 1951, as there was a need for space, the 6th, 7th, and 8th grades were attending school in the newer high school building. The 1870 building was abandoned and torn down in 1960. Following the formation of a township school district in 1916, a "modern" high school building (pictured at the top of this page) was built in 1921 and opened in 1922 and was abandoned in 1985, with the last graduating class. The school was built with bricks from our local "Walter's Brick Factory" and wired by our local "Ortman Electic", for the cost of $113,000. This building served as the Chatsworth High School building for 63 years. Following World War II, the school added on the agriculture building (below, still standing) in 1946 and the gymnasium (scoreboard seen on this page below) in 1949. In 1985 the school districts in Chatsworth, Forrest-Strawn-Wing, and nearby Fairbury-Cropsey agreed to consolidate their efforts. The new district was named the Prairie Central School District with the high school located in Fairbury. The fate of the original Chatsworth High School building is a sad one. The building was razed shortly after the consolidation of high school took place. There is a school still operating in Chatsworth for grades PK-4 for the Prairie Central District. For a truly excellent tribute on the town of Chatsworth and its former high school please check out www.chatsworthillinois.com . The site was developed by brothers Bob (now of Arizona) and Jim (now from Washington) Saathoff. It contains an excellent photo gallery and a tremendous amount of information on the city's rich history. Also go to http://picasaweb.google.com/rgschs1960 for more great photos and Chatsworth High School information. Great job and sincere thanks to Bob and Jim Saathoff!! 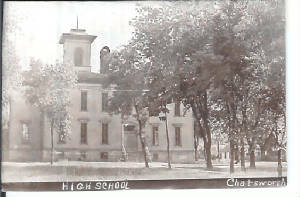 A second excellent tribute to the town of Chatsworth and its former school is titled "Chatsworth Illinois Memories" and can be viewed at http://sites.google.com/site/chatsworthillinoismemories. The site was developed by Mary Hanshew and gives another great account of the history of Chatsworth and Chatsworth schools. The site includes several great photos as well. For a town to have two websites such as these to honor its storied past, it must have been a great place to live! School Fight Song: Those Chatsworth Bluebirds! Words provided by Mary Hanshew and Friends! Oh, when those Chatsworth Bluebirds start to fight. Our foe will never live to see the light. 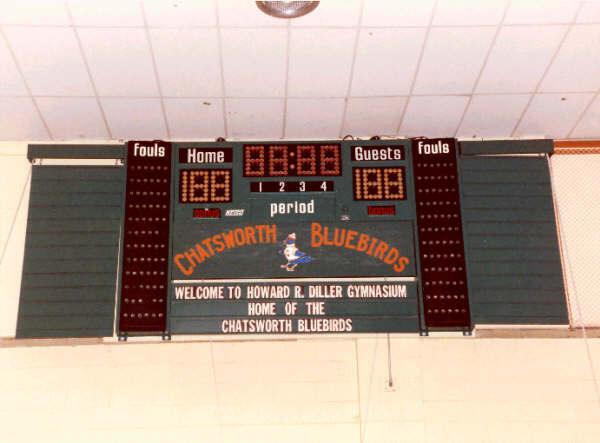 The Chatsworth Bluebirds had success on many different levels in athletics. The Bluebirds competed in the Vermillion Valley Conference and offered the boys sports of football, basketball, and track. The girls were offered volleyball, basketball, and track as well. It is possible that baseball and softball were offered; however, there is no mention of this on the IHSA web site (www.ihsa.org). Not too many high schools the size of Chatsworth can claim the success that the Lady Bluebirds attained in their short existence. How about SIX Sweet 16 appeareances, THREE Elite 8 appearances, in a seven year period? Check out these accomplishments, first listed in order of greatness, then season by season. Incredible run by the Lady Bluebirds!!! The Chatwworth High School boys could play basketball quite well, too. In the seasons recorded from 1929-30 through the schools' closing in 1984-85, the Bluebirds earned five Regional titles and four District titles. They also posted 14 seasons of 20 or more games won. Conference championships are not available at this time. Coach Barry Corban had an incredible 15-year run with the Bluebirds. His overall record, which included the past 15 years of the school's existence, was an incredible 307 - 93.....a .768 winning % !!! Did not win tourney - other scores for Chatsworth needed. District Tourneys not held this year. 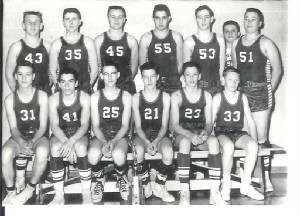 1939-40 through 1947-48 Postseason scores, records, and coaches' names needed. 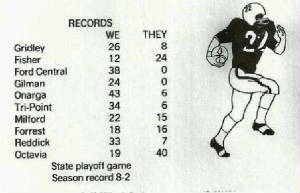 1966-67 Postseason scores, record, and coach's name needed. WATSEKA (72): McKean 17, Burns 15, Yergler 12, Bivan 8, Dannehl 7, McGuire 7, Laughlin 4, Muller 2. CHATSWORTH (54): Kurtenbach 22, Hornstein 16, Scott 6, Diller 3, Fisher 2, Sterrenberg 2, Drilling 2, Rosendahl 1. MAHOMET-SEYMOUR (61): Farley 26, Scott 18, Kesler 10, Thompson 3, Anderson 2, Nichols 2. CHATSWORTH (53): Scott 20, Rosendahl 14, Hanauer 7, Gerdes 6, Milstead 4, Sterrenberg 2. *1984-85 was the final season for Chatsworth High School. Nice job Chatsworth High School Bluebirds! Only one season is recorded on the IHSA website regarding the Bluebird football team. 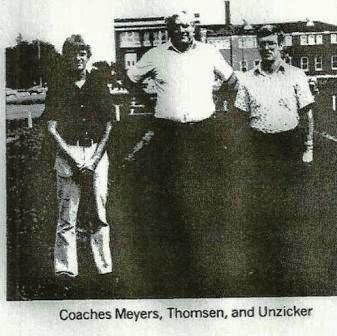 The team of 1978-79 qualified for the IHSA Class 1A playoffs. 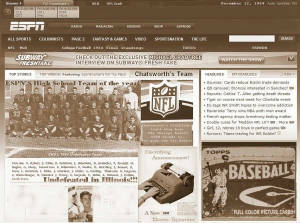 "Chatsworth had a long and storied football tradition. 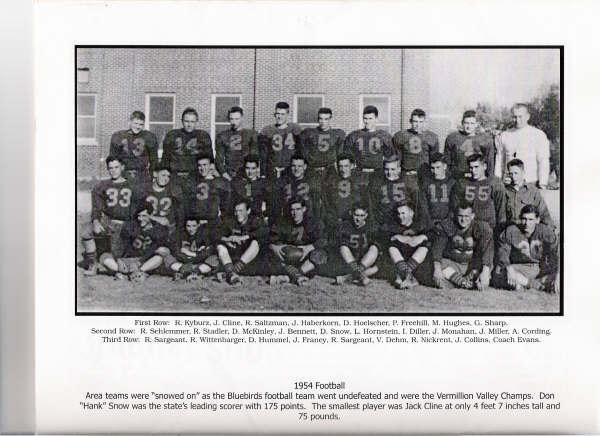 At one point they won 27 Vermillion Valley conference games in row between 1959 and 1962." Don Scored 175 Points in his 8 games! - They finished the football season undefeated and won the conference title in the process. - For the regular season, the team outscored their opponents with 315 points by the Bluebirds vs. just 32 points (total !) for their opponents!! - They averaged 40 points per game. - Of the 315 points that the team scored, Don Snow scored 175 of them. I asked Dr. Don Hummel - a junior at the time - what the secret was and he said it was Don Snow, mean linemen, a great quarterback and a fabulous tactician and coach - George Evans. By the way this year will be the Class of 54's 55th class reunion. Great memories from that group!!" See Bob's ESPN wish come true below! 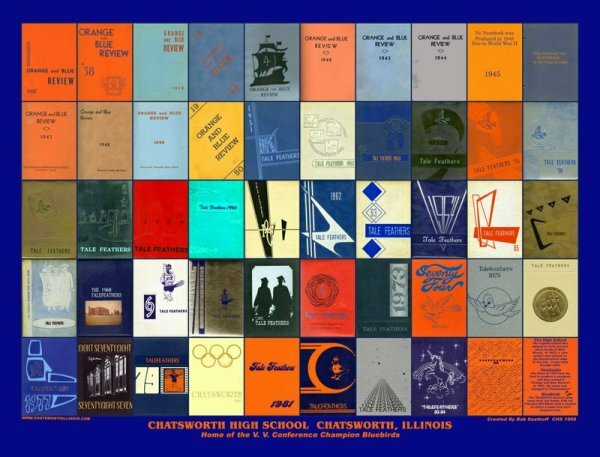 Chatsworth was likely the smallest school to make the field of 80 teams. **Chatsworth High School dropped football in the fall of 1980. The enrollment was 90 students and 29 boys signed up to play, 15 varsity, 14 F/S. There were no "co-ops" in those days so for fear of injury the school board chose to drop the sport. The Lady Bluebird netters won a District Tile of their own. However, the team record and coach's name of this and other good Chatsworth High volleyball teams are not available. One female thinclad left a great mark on the IHSA Class A Track Meet. 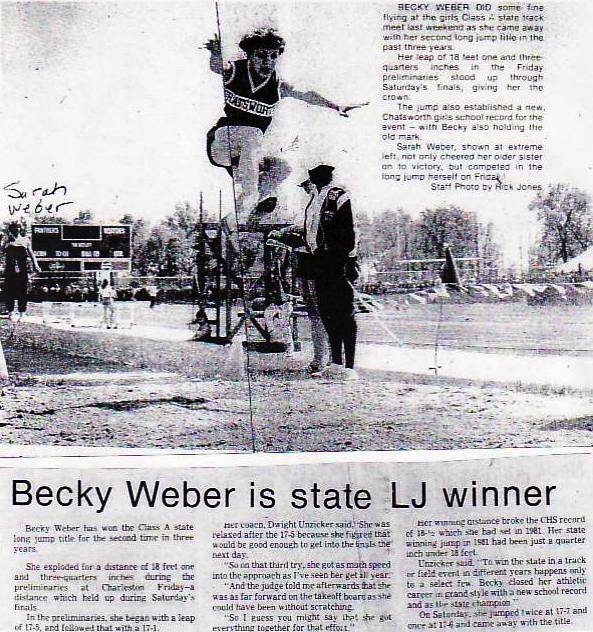 Rebecca Weber won the State Championship in the Long Jump in 1981 and 1983. Rebecca Weber Long Jump STATE CHAMPION!! Four male tracksters brought home a total of seven medals from the IHSA state teack meet. --Bill Kibler (1920-1957) Mr. Kibler was on the faculty at Chatsworth for over four decades, serving as a teacher, basketball coach, and superintendent. The athletic field at the school was named in his honor in 1959.